Last month, we put the call out for any suspension specific questions you might have. Many of you took the opportunity to ask questions, and they ranged from simple queries to far more complex enquiries, which, as it turned out, required far more complex responses. cr1sher: Hi! Which parameters have influence on the damping? How can someone adjust the bounce and rebound setup at front/rear? MG: Any detail of the car can have influence on the damping. Apart from the well known facts like springs, tires and purpose of use, also weight, anti-sway bars, aerodynamic, axle kinematics and last but not least the driver’s style have influence on the damping. Therefore, it’s quite interesting to modify a car step-by-step so you see and feel the reaction of the package on that new feature. Shock adjustment can be dialled in through the separate reservoirs (compression low/high speed) and at the end of the piston rod (rebound). Curiousbuyer: How does a 3-way adjustable versus a 2-way adjustable and a single adjustable relate to a car that produces significant downforce, versus a car that is used for road racing, assuming no cross talk? If I was running a Formula Atlantic car versus a BMW 3 Series in the SCCA run-offs with a track with aggressive curbing, how would I expect each suspension to react given a fixed spring rate? How much of a difference do you see in lap time across the various suspension systems given a standardized platform assuming a competent driver is at the wheel? MG: First of all, the philosophy of KW is that a car is standing on the springs and driving on the shocks. 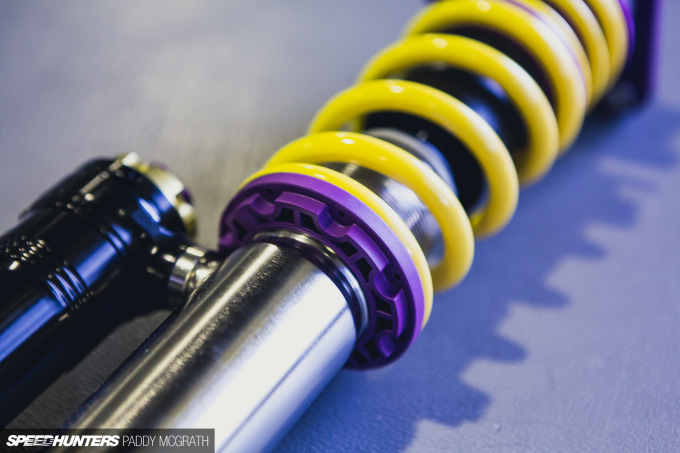 In other words, the weight of the car is carried by the calculated spring rates front and rear, but the performance is served by the shock’s unique technology. Comparing the various systems, you simply start at the full option (3-way), and then look at the compromises you need to make coming down to 2-way or 1-way units. Compromises because of one important fact: there is never a perfect rebound or compression value, but there is a perfect rebound/compression ratio. This means if one adjustment is locked, you have to find a compromise to match this one with the other adjustments. In terms of lap times, the worst case is you will not be faster, but you will achieve the same lap time in a more relaxed manner. Ben: Why do you only offer ride height adjustment through the adjustment of the spring perch instead of allowing a separate adjustment of the whole body like competitors such as Tein? 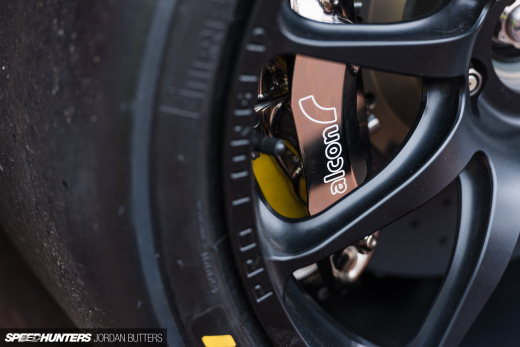 Rather than having a predetermined minimum drop as designated by the shorter shock body, you could provide a longer body which would offer more stroke/travel and then tune the ride height separately while corner balancing. Is there an advantage to your method versus the competition? MG: Regarding the height adjustment via the bottom bracket and threaded tube, there are two main reasons why KW suspension is designed this way. Using an adjustable unit might cause TÜV problems as you can lower the car without adjusting the spring seat. A more important fact though, is that in general the bracket is metal or alloy, along with the threaded tube. That many not be a big problem in sunny California, but in Europe this combination will rust solid after the first winter thanks to salt, dirt and corrosion. Louch: Hi there KW engineers! How well can you adjust 3-way adjustable (high and low speed compression plus low speed rebound) dampers without proper data-logging? MG: Working on a car without any data-logging is possible, but it’s more ‘emotional’. Of course, you can adjust the car – you simply have to rely on your feelings, the feedback of the car and the time on the clock. As soon as you feel comfortable in the car, the lap times will drop. To find the right adjustments, you either know about the single adjusters or you simply start from scratch. 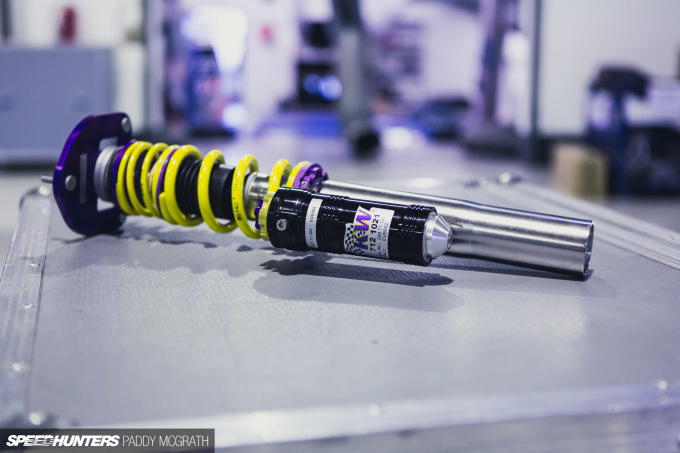 As every KW suspension kit is supplied with a basic setup, you always have a base to return to in case you get lost in adjustments, but beside this, feel free to dial and test in order to get a feeling for the range of the shock. Most importantly though, write down your feedback after a test drive together with the adjustments, so you can reproduce it. el_kuks: As I know, on front-engined cars front dampers and springs should be stiffer than rears. But what about rear-engined cars? Also, are there any rules in choosing spring rates depending on car’s weight? MG: Unfortunately, I can’t agree with your knowledge. Spring rates do not rely on the location of the engine; the only thing R&D engineers are looking at is the spring rates at the wheels. There are given facts about their amount, and following the position of the shock, the spring rate has to be chosen. This means, if the wheel spring rate should be 20N/mm and the spring has a 1:1 ratio to the wheel, you have to choose a 20N/mm spring. If the spring has a 1:2 ratio to the wheel, you have to choose not a 40N/mm but a 80N/mm spring. The vehicle’s engine position has no bearing on this this calculation – it’s just axle kinematics. 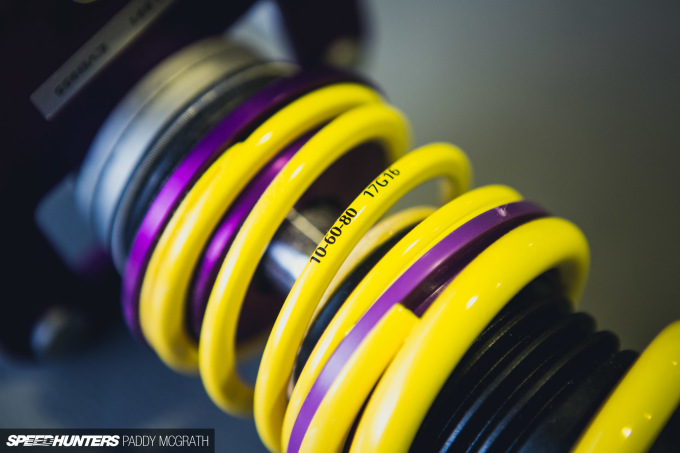 RyanKuan: I just installed a set of KW Variant 3s in my 2014 Fiesta ST – the quality of the coilovers for the price is unmatched by anything else. I’m having a hard time dialling in the handling and ride quality to my liking; the car is pretty bouncy and still understeers. I want to get my car to rotate easier in the turns and have a more compliant ride quality. Currently I have the car set stiffer and quicker rebounding at the rear. Please point me in the right direction. MG: It’s always tricky to give a diagnostic via email or online, but I will help to solve your problem. There are some questions you’ll have to answer yourself though. First of all, how was the performance of the car in stock condition? Then, what other upgrades have been made to the car? Is it only the suspension, or could other things like wheels, tires, sway bars, maybe weight reduction, or even seats be affecting the feeling? Furthermore, take a look at the suspension setup – has the ride height been checked and a wheel alignment been done? How about your purpose of use – street/daily or track? Try to answer all the questions and maybe you will find the answer yourself. Otherwise, feel free to add your findings in the comments section. Ducky: Hi KW, I remember reading a book suggesting that the softer dampers were set up, the better they would be. What are the signs of the car being set up too soft? Thanks for your time and have a nice day. MG: As I wrote earlier, there are different philosophies on both the manufacturer and driver side. Of course, you can’t run a race car with street comfort spring rates and vice versa. The decision between softer or stiffer spring rates (within a certain given range suitable for the car) is dependant on the driver only. 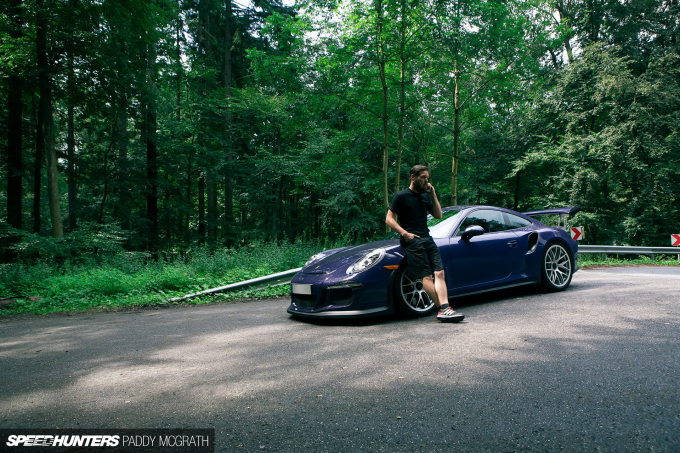 Let’s take the Porsche Cayman GT4 Clubsport race car as an example. There are two spring seats available for the upgraded spring/damper solution – a stiffer and a softer one. In several series, cars finishing in podium positions are running one or the other dependant on driver preference. In general, a softer setup provides more feedback and better mechanical grip, but will require a smoother driving style. The stiffer setup is more aggressive and allows sharper and more direct orders to be made to the car. There is no right or wrong – either setup can win. 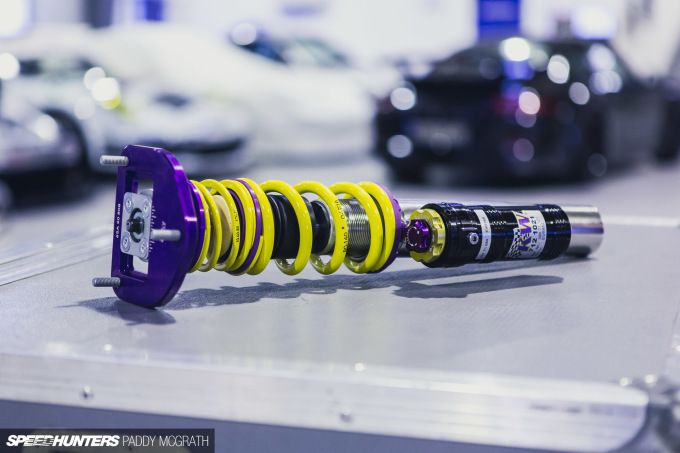 Nis14: Hi KW team, I’m not on KWs – I’m on entry-level coilovers in my Genesis Coupe. The car is moderately dropped and used as a weekend fun car. The car handles pretty decently, but I was wondering if you could let me know about ways to smooth out the ride. I’m in Seoul, Korea, where there are a lot of crappy roads. I’ve swapped out the coilover springs to Swifts which actually helped, but I was wondering if there were other things I could do? I’m really not a fan of the jolts and harshness. I can live with it, but if I can tune it out, it’ll be wonderful. Thanks! MG: No matter which cars or racing series we are talking about, it all comes down to one fact at the end of the day: your budget. In my opinion, the suspension subject is quite an important one as it is not only a style but more so a performance feature. Therefore, don’t make compromises when buying a suspension kit. As I don’t know about your entry-level coilovers, I can’t say if they are okay or not, but in general, going with a well-known brand and consulting one of its dealers in your area would avoid complaints afterwards. bluestreaksti: Is it possible to make a shock absorber that take any spring rate (or a really wide range) and not have to be re-valved? MG: As shocks are custom built for a single car and its purpose of use, there is no need for a shock to take any spring rate. Of course, a certain range of adjustment is required, but it’s far cheaper to re-valve a shock if you are running out of adjustment instead of searching for an infinitely adjustable shock. 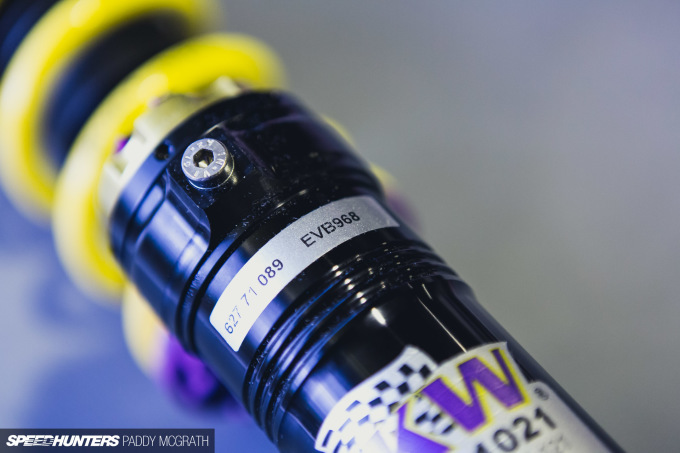 GeoffreyTyndall: I unfortunately don’t have KW suspension but I have gone from bone stock suspension to single adjustable (rebound) dampers. What steps should I take when it comes to adjusting them for ‘spirited driving’ and then for some type of track driving (autocross, race track etc)? MG: It’s not a question of adjustment, it’s more a question of layout in the first place. 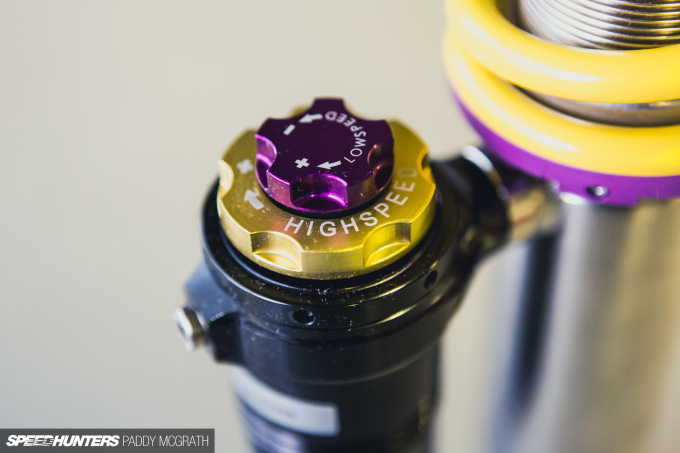 Did you buy a street kit for daily use, or did you buy a single adjustable race shock? It’s quite easy to set them up – if you don’t feel a big difference when adjusting the shock, you are not in the right window of forces. For example, if you autocross car requires shock forces of 3000N on the front axle and your adjustment ranges is 1000-2000N, then you are lost from the start. Therefore try to analyze your purpose of use in advance and order your suspension depending on that. Another important thing is to think about the main purpose of use. It doesn’t make sense to order a race kit for your daily driver if you are only on the track two times a year. In that case, you’ll have a unsuitable setup in your car for 363 days of the year. nzos14: I have KW V3s on my 996 Turbo, lowered to about GT2 height. I love the way they perform, though I have not adjusted the rebound or compression at all from stock. The car is 3400lb, about 50/50 street/hard mountain driving, very little track time. What settings would you recommend for maximum performance? Running 245/335 tires for reference. MG: You can find the recommended settings for this suspension kit in the KW papers that were included in the package. 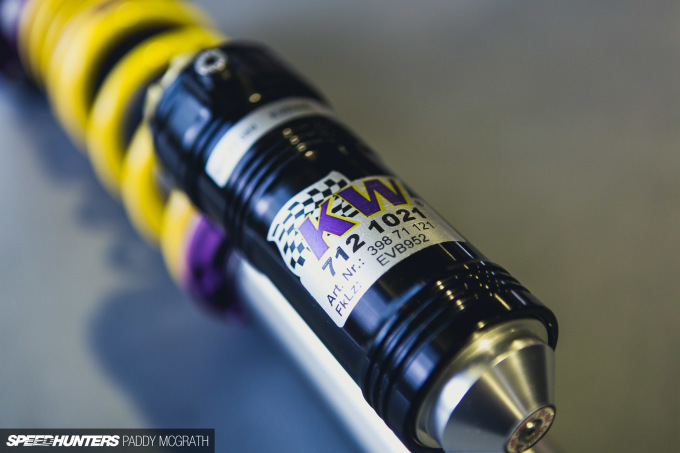 The basic adjustment the shocks are delivered with are exactly those ones which KW engineers tested during the R&D process, and in addition to that were analysed on the 7-post rig in the KW facility. Therefore, I would start with the basic settings. For the Porsche, I personally like the immediate feedback of the rear end. This means once I steer into a corner, I’m awaiting the feedback of the rear outside tire so I know about the back end of the car and whether it’s rolling, sliding, gripping etc. This feedback can be adjusted by compression and rebound at the rear shocks. Also, I want a precise steering and good brake power, and this can be adjusted by compression and rebound in the front shocks. Therefore, it’s best for you to analyse the current performance of the car and then do testing from there. BlackSandsJenova: Hi KW, I’m currently running zero preload, 30mm lower ride height than standard and neutral damping settings on my MR2 turbo. After much trial and error, this combination has given me a comfortable and balanced road setup helped by thicker ARBs, polybushed suspension and performance street tyres. What changes (if any) would you suggest I make to my coilover setup if I were to attend more track days? Any adjustments in preload/damping/ride height etc? Would love to hear an expert opinion from yourselves, thanks. MG: Unfortunately, you didn’t tell us about the suspension in your car, and therefore it’s hard to give you any recommendations. It’s good to hear you already went through some trial and error though, as this is how knowledge is created. Don’t be afraid of turning the knobs, because that’s what they are for. In terms of setup, try to determine whether your current suspension kit is still suitable for the car’s new purpose of use. Think about your car compared to a bone-stock MR2 – how big are the differences? Always remember, suspension kits are designed for stock cars, and a KW V3 for example, for daily, sporty road use. Diesel Dude: KW suspension gurus and any other person feeling qualified enough to answer: what are some of the pros/cons to anti sway (roll) bar preloading? I have heard with adjustable end links that you can preload the bars to a certain degree and effectively/minutely change spring rates. Also, is there any golden rule or ratio with how much body roll is effective? On the internet, it seems there are opinionated extremes, but no data to prove it. MG: I understand what you mean, but at the end of the day changing preload means you change the stiffness of the anti-roll bar. The anti-roll bar, together with the links, has to be seen as one unit. When changing the length of one link, you preload the whole system and the sway bar unit gets stiffer. This is roughly comparable with the PDCC in the new Porsche models, where a hydraulic shock substitutes the anti-roll bar link and operates exactly in that manner. There are other factors (springs, shocks, aero etc.) that contribute to body roll, so I can’t give you any golden rule for this. 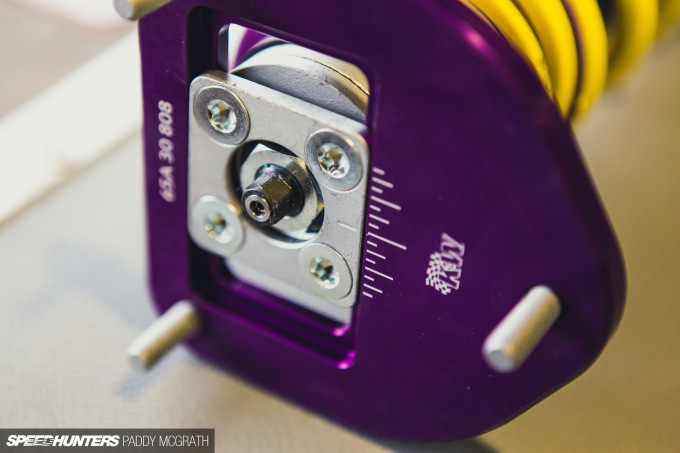 E2419: What is the ideal damping ratio range for autocross purposes? And assuming it’s track specific, is there good starting point information you can provide based on measured corner weights? MG: Corner weights are a good point to start, but further details like axle constructions, droop, tire sizes etc. are also important. Supplying all this information to KW’s race engineers will allow them to design and custom build (by length, forces, add on brackets etc.) a shock specifically for your car and its purpose of use. Klass: Hi, I have the KW Variant 3 in my Golf Mk2. The only thing I’ve changed is the height of my car; I put it lower to the ground of course, and in combination with 16-inch wheels and 205/40R16 tires it feels incredible. I’ve also left the camber untouched. My question: is it possible to make it a little softer but also have a good amount of grip at lower and higher speeds? Best regards from Düsseldorf. MG: Because you are using Variant 3s, you surely can use the adjustment possibilities to adapt the setup of the car to your requirements. The only thing you need to take into consideration is the minimum ride height. As soon as you are underneath this, adjustments won’t cause a big reaction as you are simply running out of travel. Once this is okay, try to soften the rebound for 1-2 clicks per axle as this will influence the comfort of the car. Unfortunately, smaller, lighter cars react more sensibly when it comes to ride comfort. The reason for this is that the suspension package has to perform at maximum stress, which happens when the car is fully loaded. Of course, in a lighter car like a Golf, the percentage of additional weight caused by five persons and luggage is higher than in a BMW 7 Series for example. 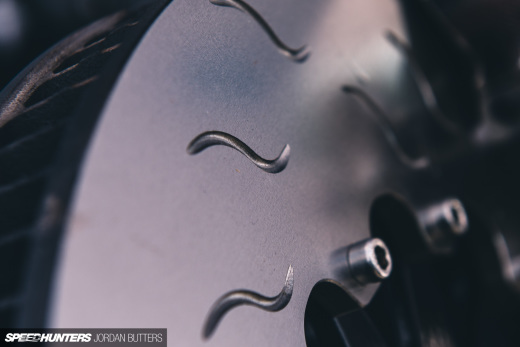 Therefore, the springs have to deal with a higher range of weight difference, and together with the higher lowering rate the ride quality will be sportier than in a heavier car. 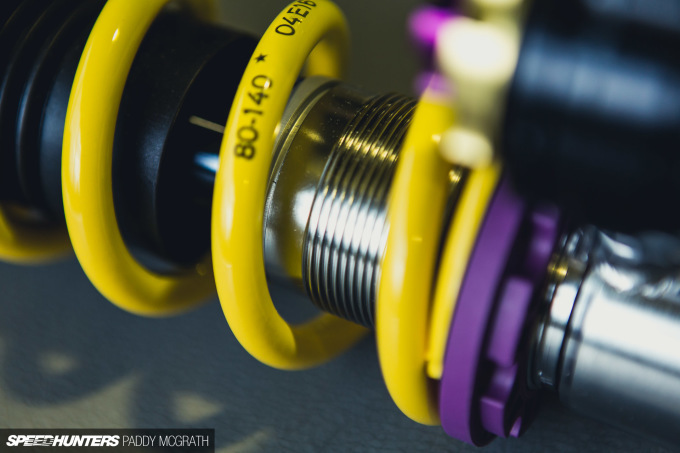 Frank Candeloro: Hello, how do you properly set up spring preload on a set of coilovers? I have a set that can change ride height independently of the spring preload, and have always wondered the correct way to do this. Thank you! MG: The only important fact you have to take a look at are negative and positive travel ways on the car. This means you have to adjust the car to your required ride height and from there adjust the travel ways. As an example, if the shock offers 120mm of travel, I would adjust the shock to 50mm travel in (positive) and 70mm travel out (negative). N Wyatt: In what ways will my suspension be ruined by lowering my car without modifying the control arms? Finkregh: Dear KW, since I live in Eastern Europe, budget is always very tight, so lowering springs are usually the only viable solution. I am looking for a set of progressive lowering springs to combine with my standard shocks (30mm drop max). The aim is to improve the body roll without compromising too much on the comfort side, and maybe to improve high speed stability (for the occasional Autobahn run). The internet seems to be very divided about lowering springs. Is my reasoning correct or am I risking to compromise my suspension and will not see any benefit? PS: I drive a Ford Focus Mk2. The springs I am looking at seem to have been, at some time, a factory option, but I’m unsure if they were ever sold like that. MG: Fully understandable, you are the only one who can decide on how much to spend. Sure, Speedhunters is all about car culture and we are all car maniacs, but taking your girl to dinner instead of lowering your car is always the better choice. Of course, there are lowering springs available offering a lowering in the range you wrote. Some facts in advance: 1) You will receive fixed lowering. If you a happy with the look afterwards – perfect, but if not, there’s nothing you can do about it. 2) You will have a sporty ride. 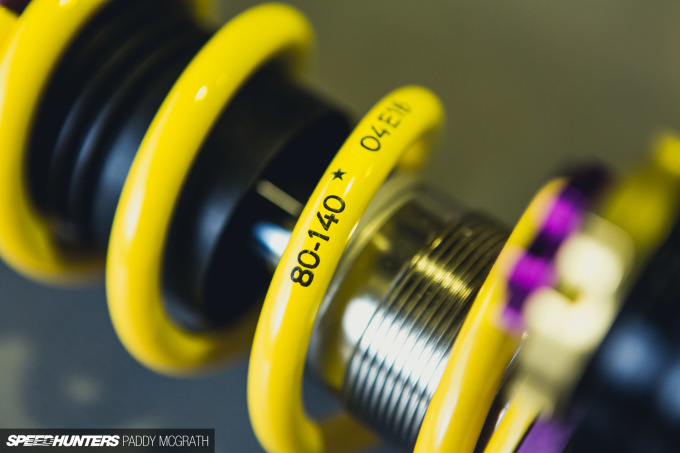 As you’ll keep your original shocks, the springs will have a slightly stiffer spring rate to compensate for the less travel ways you have because of lowering. Therefore you have two choices. Either go for the springs and deal with the named facts above, or create a plan to enlarge your budget and go for a coilover kit. No matter which solution you decide to go for, always keep some Euros spare for dinner with your girl. Sly14u: Dear KW tuning gods, my name is Spencer and I have a 1975 Ferrari 308GT4. I am not a rich man by Ferrari standards and I’m looking for a solution to update my suspension. The most logical solution that I found from KW is the HLS combined with coilovers, but this is an extremely costly solution. My alternate and slightly less expensive solution is Bilstein B16s with AccuAir bags. Can you share your opinion on the modern air versus coil-over-hydraulic solution? MG: Personally, I would go for the HLS solution. Air versus hydraulic is a huge discussion topic in itself – something like FWD and RWD – but from a technician side I would choose the hydraulic package. Hi Michael, thank you for taking the time to reply! I should have been more specific with my question about my 2014 Fiesta ST.
- The stock car handled great and was fun to drive, but being a production car it was more prone to understeer. - My car also has ST Suspension sway bars, fifteen52 wheels, Dunlop Direzza Z2 tires, and lots of bracing from Pierce Motorsports. With all the changes I know it has deviated a lot from stock, which is why I'm finding it hard to set the car up to my liking. - The ride height has been checked and alignment has been done. The toe is set to stock and camber is -2.2 degrees. - The car is my daily driver and canyon carver. After thinking about these questions myself, I am still having a hard time at grasping how to set up the damping and rebound. I know how a car communicates to its driver is very emotional, but I can't seem to connect well with it right now to know what it wants. Forgot to send my question, but I'll try my luck in comments. As you are planning to use your car as a tracktool, I would recommend to go for a KW Competition 2-way race kit- especially as unfortunately there is no Clubsport kit available for this model. Due to the fact that all race kits are built on order, it's absolutely no problem to built a kit suitable to the specs of your car. The engineer in charge will send a tech sheet which you fill out incl. any detail of the car and therefore you will receive a kit explicit produced for your car and its purpose of use. 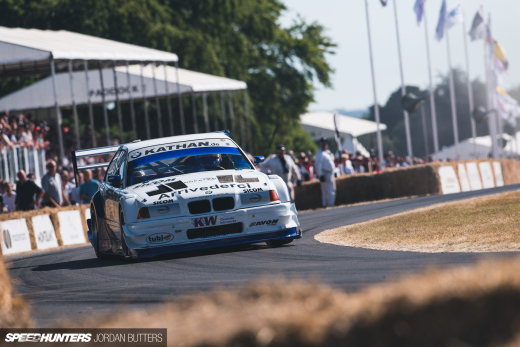 Just as a side note, KW already built several Competition kits for BMW E30 models with either V8 or V10 engines. Iam living nearby and was in contact with your engineers about my MR2 mk2 suspension.They said it might be worth a visit at your HW. I have the v3 on my E36 and my MR2 so i have kind of a direct comparison.I aslo adjust a lot on both cars. Still iam not so happy with my MR2 setup.I use stock swaybars here and Polyurethane bushings all around (only rotational joints). So my suspension is more direct but not really stiffer regarding vertical damping. Is there an option to meet up with your specialist to check things out on the MR2? I feel like the setup is choosen way too hard on this car,regarding we all have problems with those midengined cars having tons of grip on the rear..until it snap overseers.So this cars in my opinion have to be as soft as possible with that suspension to built up mechanical grip. iam on 17" tires 215/40/17 Front, 235/40/17 rear (sticky Advan neova AD08R). the car is lowered as suggested on your manual. iam very happy with the v3 on my E36 and and offers a great grip on the rear and a very predictable feeling.Sad i cant get that on my MR2, no matter how i dial it in. auf deutsch gesagt - das Auto ist einfach nicht gutmütig genug. and I will be happy to answer your thoughts- maybe it's easier than to crash the comment section. Just out of interest as I'm a Vehicle Dynamics engineer myself, during the development stages of KW's Suspension kits, how do KW manage subjective opinions of your various engineers? Do KW have a specific DNA or target to work to? Or do you engineer your work to Objective data? I find it's always an interesting topic within Chassis development and would love to hear your thoughts. That is a good question. Would love to know too. With my KW coilovers I keep getting horrible coil bind sounds at low speeds 0-2MPH even when the car is moving straight. Can you inform me what the common cause is? @Rand The springs are clanking against the top hats under low speeds. It's a common issues with coilovers. After you have the coilovers in for a few weeks, go back and check all your tolerances & torques. Sometimes bolts can loosen, endlinks can shift or loosen, etc. Have your alignment place recheck as well. How come KW rushed to market and got the springs backwards on the CT9A Evo platform? I got V3s and I like them, but previous owner had to put the fronts in the back and get Swifts for the front, I forgot the numbers, I think now it's at 8K front 9K rear, plus that's a mystery for you guys to solve, not me. Local shops/time attack guys do the same to their V3s. On the KW Variant 3, the chosen spring rates are 90N/mm front and 60N/mm rear. Together with the damper setup, KW recommend this package for sportive and comfortable daily use. Can you tell me why the previous owner had to which springs? In case of problems with your suspension you will find a warranty card within the package of your suspension kit. Just add all required data and return this to KW or your local dealer. Your problem will be analysed at the customer support department at KW and I'm pretty sure you will receive an answer including a solution to solve this issue. As you surely know, there are several facts and figures to setup up a suspension. While the amount of lowering and the feeling while driving are more optic and emotional facts, the development also includes the setup on the 7-post rig. With this tool you are looking at resonance frequency, contact patch load etc. For the final setup, all these R&D steps are taken into consideration to finalize the specs for a coilover kit sold to customers. To answer your questions, it's a mixture of emotional input + high end technicial data analysis. like 8kg/6kg. Makes sense, since the EVO is a little front heavy right? Well actually there's another factor at play. to be stiffer. Sometimes you'll see people mention the "motion ratio." (almost). For the rear, it's somewhere between .6 to .9. So that 8kg/6kg is really more like 8kg/3.7kg ish." my father in law just got a great Mercedes CLS-Class CLS63 AMG from only workin part time on a home computer.. I spoke with KW once, it went like this! ME: Hi, I saw on motoiq that you made a set of coilovers for their R32 GTR time attack car, I recently purchased an R32 GTR and would like to purchase a set of your coilovers, do you make a set or can you duplicate their setup for me? THEM: Sorry, we don't support the R32. ME: Oh, what would it take to have you fellas make a set? Coryislost I'm not speaking for KW, but they were likely Competition coilovers on the MotoIQ car, which are completely bespoke. I don't think a competitor would appreciate if a rival could just ring up a company and ask KW to make them an identical set. as Kim explained I cant believe that a mother can get paid $6542 in 1 month on the computer . my aunt got a nine month old Infiniti Q X 70 just by some part time working online with a laptop..
Paddy McGrath Coryislost Yeah, I get that as this was their WTAC setup from years and years ago, and that's fine, but they couldn't / wouldn't even entertain making a set of their v2/v3s for my car. I'm sure there are plenty of fellas that enjoy the BNR32 platform and would like a set of their suspension, they make them for the 300ZX as well :-/ It was more the fact that they wouldn't even respond that turned me off to them, and their silence here speaks volumes.